Angelgate Daycare Inc Reading Lessons will primarily focus on teaching children to read and to enhance their written and comprehension abilities. In a world of over-crowded classes, budget cut-backs and school curriculum alterations, it is quite clear that the children are the ones to suffer the most. We value and respect the teachers employed through the boards of education yet the much needed "one on one, teacher-student" opportunities are unfortunately becoming more and more of a struggle. Knowing that "reading" is the base of all learning experiences, we are confident that our "phonetic approach" (as opposed to a "whole language" approach) will give Angelgate children an extraordinary opportunity to make great strides in their education overall. The program and its curriculum are designed to run from September to June annually. Follow a phonetic-based curriculum that teaches children to "break down" words rather than memorizing them. Have classes available in the mornings, afternoons and evenings, in order to accommodate every child's day school schedule. Provide a calm, quiet setting in order to facilitate the learning process. Accommodate all children's learning levels, unique personalities, self-confidence obstacles and coping skills. 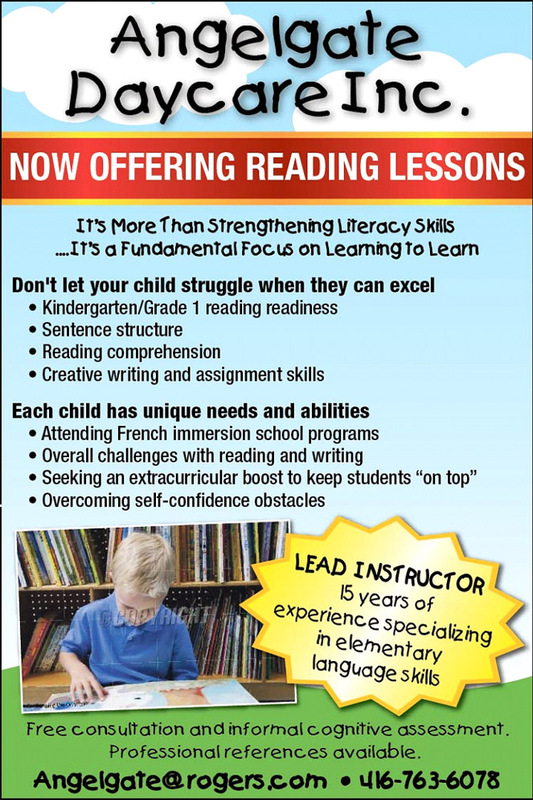 Not only assist children with their reading, writing and comprehension, but also teach children how to "learn". For the sole benefit of our children, this is a program that's in high demand and we are so excited to be offering it! We've got the room, we've got the instructors, we've got the curriculum and the tools to give your child a boost in their schooling! For further information on the classes, times available and tuition prices, please contact Frances. School Boards across the country have given their curriculum a “French push�?over the last several years. Learning solely in English (with a touch of French) was predominantly the norm, however with each passing year more and more children are learning French as a primary school language. Regardless of how your children are grasping the French language, allow Angelgate to assist them in their learning. Knowing how popular our English lessons are and the necessity of extracurricular tutoring, our newly hired, bilingual teacher Devi approached us with wanting to expand our tutoring dept , by teaching a French class weekly. It balances our English classes, it allows Devi to put her talent to work and it assists our students who may need that extra boost when learning the French language. As with all of our tutoring programs, the children will learn in a small group setting. The program involves exposure to daily French conversation, flash cards, common objects and toys as well Reading and Literature. If you have any further questions, please contact Frances by email angelgate@rogers.com or by phone 416-763-6078. The perfect balance in your child’s extracurricular education...a couple classes per week in both English AND French, all under one roof. By the time your day is done, your children have had their lessons and are ready for quality “family-time�? Don’t let your child slip behind, especially when a tutoring schedule is as simple as this. Contact Frances and ask how to enroll in both programs today!!! Bloor West Village's well-known childcare centre is evolving once again. Angelgate Daycare Inc. (known simply as Angelgate) has proudly served the community for 16 years, providing exceptional care and quality programs for children ages 2 to 12 years old. Coming this fall, Angelgate is adding a group of much-needed reading programs under the guidance of their experienced lead reading instructor. Morning, afternoon and evening classes will be available each week from Monday to Thursday. The overall focus of the program, which will run annually from September to June, is to strengthen the reading, writing and comprehension skills of children in Kindergarten and Grades 1, 2 and 3 using the phonetic approach. If your child is enrolled in a French school setting or struggling with their literacy skills, or if you are interested in giving your child an added advantage in their academics, Angelgate has a program to suit you. Call to book an appointment and find out why the Ministry of Education honored Angelgate Daycare Inc. with an A+ perfect score of 100% on their 2013 annual licensing review. Registration begins August 12th, 2013.